Whoever Said You Can’t Have A Pink House? Pink and the month of October have become linked by the many organizations that support breast cancer awareness. With so much talk about the color pink I started thinking about how pink has been used on home exteriors in the past and how it might be used today. In many cities and towns across the US there is a historic home aptly named ‘Pink House” for its distinctive color. Built in 1846 Roseland Cottage (top left) epitomizes Gothic Revival architecture with its vivid color, steep gables, decorative bargeboards, and ornamented chimney pots. James Habersham House (top center) is Savannah’s Olde Pink House named for the beautiful shade of “pink” stucco, which covers its old brick. One of the best known homes in Cape May is The Pink House (top right), or Eldridge Johnson House, is said to the fanciest porch trim in the city. But what type of homes look great painted pink, today? 1. A Victorian. Pink shows off the delicate, ornate details. Castle Gray standard blend DaVinci Multi-Width Slate is always a great bet with pink. 2. A cottage. Pink turns a quaint cottage into a storybook home like this one once owned by Elton John. DaVinci Multi-Width Shake tiles in Chesapeake standard blend would be a perfect way to top off a pink cottage. 3. A southern stucco. Stucco houses are often painted in rosy shades from natural clay and sun-washed pink. Rather than gray or terra cotta, dark brown is often seen on the roof of these homes. Above you can see how well Valoré in Medium Tahoe and Light Medium Tahoe blends with the soft natural pink on this contemporary home. The whole house is not the only way to go pink. How about a pink front door? 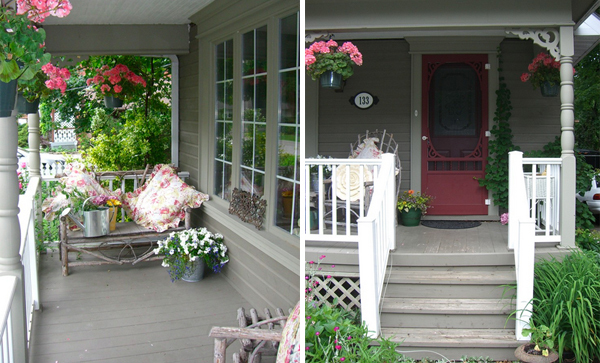 The vibrant pink door was a great choice for this warm gray home. Ready to go pink? If not on your home, consider participating with one of the organizations supporting pink in October.